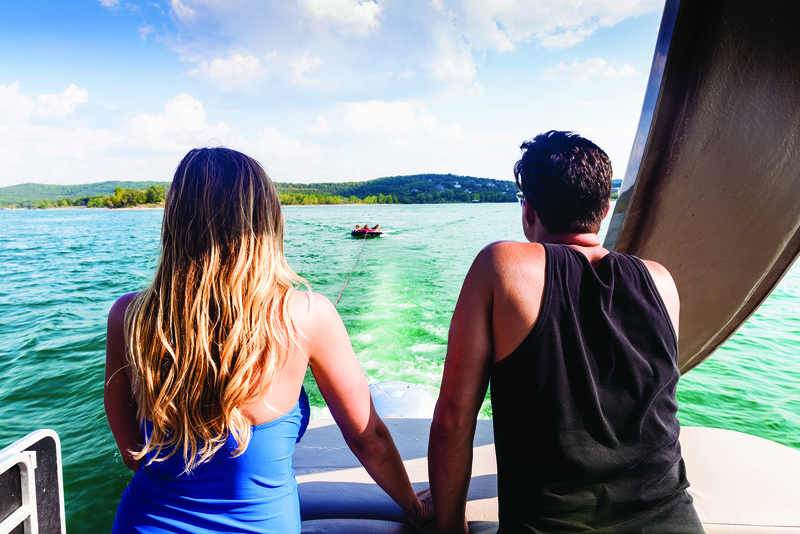 With tree-lined shores, crystal clear water and hidden beaches, it’s little wonder Table Rock Lake is one of the Branson's top destinations. Enjoy boating, fishing, sailing, waterskiing, wakeboarding, camping, hiking and sightseeing in this beautiful Ozarks vacation spot. There are over 100 resorts adjacent to Table Rock Lake, as well as ample campsites, so there’s plenty of places to stay. But Branson’s Entertainment District is only a short drive away too! Whether you’re passing through for just a day or staying for a week, read more below to help you plan your next visit to this Ozark treasure. With almost 800 miles of shoreline, Table Rock Lake has many beautiful spots for taking a dip in its crystal clear water. Moonshine Beach, adjacent to the Dewey Short Visitor Center Recreation Area, is the most popular and offers a spacious, sandy beach where you can swim, dive, sunbathe, picnic, hike, play volleyball or just view the wildlife. If you want to escape larger crowds and boat traffic, the Beaver area located on the southwest corner of the lake is a favorite swimming spot. Cape Fair, just off Highway 75, offers wide-open water for plenty of swimming. Many of the campsites also have swimming areas. Please note that swimming is forbidden in some parts of the lake, especially near the marinas. 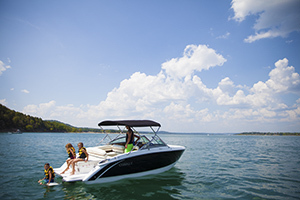 Whether you’re looking for active water sports, a quiet day fishing or a SCUBA diving adventure, Table Rock Lake has ample options for boat and equipment rentals. The State Park Marina rents everything from fishing boats and wave runners to water skis and inner tubes. You can also try parasailing or hop on the Spirit of America, a 48-foot-catamaran, for a guided afternoon excursion. The Indian Point Marina rents a variety of boats including the popular pontoon boats, and offers a ship store and gas dock if you need to resupply your own boat. Enjoy the many hotels, lakefront resorts, condos and motels available at Table Rock Lake. The luxurious Chateau On The Lake Resort Spa and Convention Centre offers stunning views of both the lake and Branson, as well as indoor and outdoor swimming pools, a spa, convention areas and restaurants. For a rustic Ozark Mountain getaway, book one of the many cabins lining the waterfront. Cabin of Dreams is a large, wood-paneled cottage with a fireplace, porch and all the amenities set on a forested hill in Hollister, minutes from the shore. Many other locations offer comfortable-to–luxe cabins, including Cross Timbers Lodge; Eagle’s View Cottages; Holiday Hideaway Resort; the Lakeside Resort, Restaurant & General Store and the Wilderness Club at Big Cedar. Experience waterfront beauty and quiet woodlands at one of Table Rock Lake’s numerous campsites and RV parks. Table Rock State Park has two campgrounds and features basic and sewer/electric/water campsites. They also offer specials at the State Park Marina. Viney Creek Recreation Area has campsites on the western end of Table Rock Lake and is surrounded on three sides by water for a truly scenic experience. 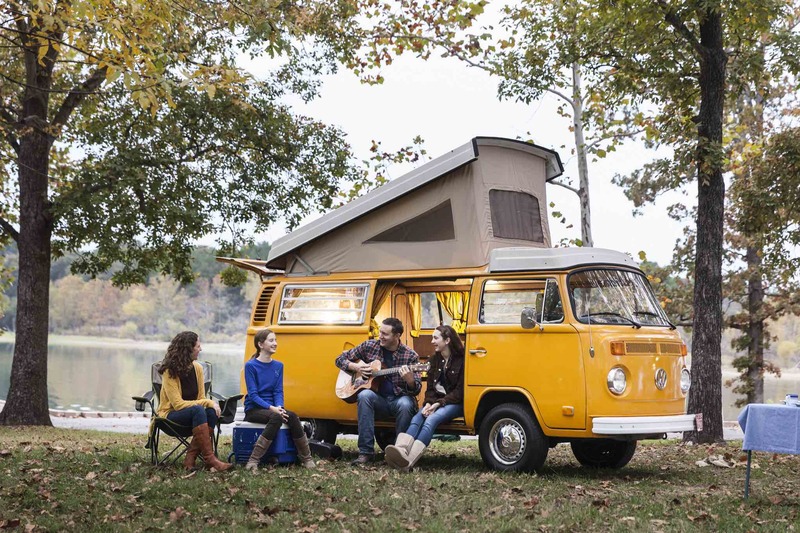 If you’re looking for a great spot to park your RV, the Table Rock Lake Campground has full hook-ups (including Wi-Fi) and offers year-round parking in addition to reasonable monthly rates. Whether you’re looking for an elegant dinner with a breathtaking view, hardy barbecue, or a downhome restaurant where you can park your boat, there are many great dining options around Table Rock Lake. Enjoy stunning sunset views of the lake with a delicious meal of “gourmet comfort food” at the Stonewater Cove Resort and Club. For sweeping Ozark Mountain views, Top of the Rock features a variety of dining options including Osage Restaurant, Buffalo Bar and Arnie’s Barn. Or enjoy a meal right on the lake at the Floating Café at Indian Point, Danna’s BBQ and Burgers at the State Park Marina or Lakeside Restaurant in Branson West. Just off the lake sits The Steak Inn in Shell Knob, a longtime favorite serving the best top sirloin and stuffed shrimp in town. There are many great sights to see in and around Table Rock Lake. For sightseeing from the water, take a ride on the Spirit of America or book passage on the Showboat Branson Belle, a two-hour cruise featuring lunch or dinner and live entertainment. For a land and water adventure, you can board Ride the Ducks and enjoy a tour of Branson before splashing down in Table Rock Lake. There are also a number of sights to see on land around the lake including the Talking Rocks Cavern, where you can explore a cave and see how mineral and rock formations grow; the Shepherd of the Hills Fish Hatchery where 1.1 million trout are produced each year; and the always fun Silver Dollar City amusement park. You’ll never be bored in Branson! Table Rock Dam and Powerhouse was completed in 1959. For a map of Table Rock Lake, obtain a printed map from the Corps of Engineers or visit their Web site (PDF file). Plus, you can find even more amazing outdoor adventures in Branson here.